They did it to former Virginia Republican Lieutenant Governor Bill Bolling who was considered by some to be too conservative when he ran for lieutenant governor in 2005 only to turn around a few years later and be labeled not conservative enough by the newly-arrived “uber-conservative, Tea Party wing” of the Republican Party, as Politico calls it. Reinventing, that is (see Reinventing Jeb Bush: How America misremembers the family’s true conservative). That same accusing finger has been pointed at activists and volunteers in an effort to discredit them while the right moves forward with their “uber-conservative, Tea Party wing” candidates. Make no mistake; it’s a strategy. Heard of Saul Alinsky’s “Rules for Radicals”? The “uber-conservative, Tea Party wing” of the GOP has taken Alinsky’s rules to heart, not to be used against Democrats, but against Republicans. For anti-tax conservatives, Jeb slashed the state’s collections by a cumulative $14 billion over his eight years. For the devoted sub-set of supply-siders: The bulk of these cuts came via the complete repeal of Florida’s decades-old wealth tax on financial instruments. It pretty much had been the only progressive tax the state had, since Florida’s constitution forbids an income tax. For religious conservatives, Jeb rammed through education bills that created the first statewide school voucher programs in the nation, and then spent years defending them against oversight attempts. He approved the “Choose Life” license plate, and sent state money to groups that counseled women against having abortions. And, famously, he pushed through legislation allowing him as governor to intervene in the Terri Schiavo right-to-die case—and at the very end nearly triggered a showdown with a local judge by sending state police officers to seize her from a Tampa Bay area hospice. 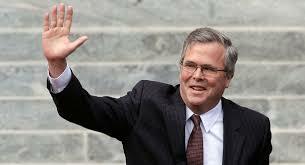 With all this on his resume, Jeb Bush is now considered a moderate? A RINO? What more can conservatives want? Dáte adds that Jeb considers himself as Florida’s education governor, a running theme in the Bush family including his brother, George W., who advocated No Child Left Behind. Jeb is also a pragmatic politician who understands that the “my-way-or-the-highway” way of governing will not work in America. But his detractors will continue to label him — and anyone else who doesn’t fit their agenda — any way they want so the Republican civil war will continue into 2016. Stay tuned…. Two items that somehow got left out: Common Core and Amnesty. Education reform and common sense immigration reform. Pragmatic leadership that Republicans need. We already have a President who supports both. Are you saying that to win in 2016, Republicans need to embrace the Obama Agenda? Good try, Rick. Education reform is rejected by some in the conservative group as is immigration reform. We disagree, you know we disagree, so let’s just let it be. Bill Bolling wasn’t pilloried for not being conservative enough – we all agreed his Senate voting record was as good as Cuccinellis – we went after Bolling for refusing to endorse the GOP nominee and working behind the scenes to elect a liberal Democrat. He got beat straight up, in the open, by a better organized team. He then took his ball and went over to T-Mac’s side. And now we have a governor ready to roll back the car tax relief. Jeb looks like Barry Goldwater compared to that. Tea party folks told me to my face that Bill Bolling was not conservative enough, and I heard it from others, too. So, yes, there were those who made that claim about a very conservative candidate. They remainder of your false comments, Chris, are laughable.